Brown Girl Art Group brings a unique blend of talent and creativity to arts entertainment, particularly the "Paint n' Sip" arena. Additionally, we provide other artistic services ranging from commission artwork to baby bump art to professional group painting sessions. Treat yourself to a BGAG Paint Night Party and enjoy some refreshments while you paint the "Picture of the day" with a little guidance from your host artist. BGAG can provide artistic activities that encourage team-building and foster collective creativity. Want to add a little more color to a baby shower? Wanna create a maternity masterpiece? Book us for a Baby Bump Painting session using your choice of art. Got an audition coming up? We can help with that! Get one-to-one assistance or group guidance from one of our BGAG Artists. We can paint the kids cute and colorful at your next event! Thinking of a theme for your next birthday bash? Or would you like to have special art entertainment at a special event? BGAG can help with art-themed parties with custom portraits or projects of your choice. Prices varies. Ask about our group rates. 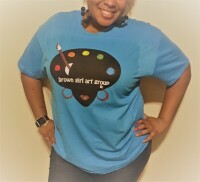 Pre-order a BGAG t-shirt in support of Brown Girl Art Group!